We applaud sustainability champions and cheerleaders! For experts, how do we keep the fire alive? For those starting, how do we stoke the flames and get started in the journey? Our very own CEO, Harris Guevarra, will share his insights on business and sustainability, and Drink’s own story in sustainability communications. 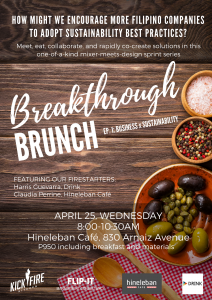 We are proud to share the stage with Kick Fire Kitchen, FLIP-IT Management Consultancy, and Hineleban Cafe, and invite colleagues in the sustainability universe for a BREAKTHROUGH BRUNCH. One of our Firestarters that morning is Harris Guevarra, President and CEO of Drink, a Manila-based communications and creative agency specializing in sustainability. The firm has been helping top corporations, leading organizations, and government agencies use their sustainability stories to strengthen their brands and communicate their impacts to both internal and external stakeholders since 2014. Harris’ and Drink’s works have received numerous awards in the Philippines and in the Southeast Asia. He wrote and directed the documentary “Iju-sha: Reportage on Filipino Workers in Japan” which premiered in Tokyo in 2016. He recently obtained a certificate course on Business Sustainability Management from the University of Cambridge Institute of Sustainability Leadership. Harris also owns Uno Morato, an independent bookshop promoting sustainable publishing in the Philippines, and a soy-based snack factory in Manila. He is also a published poet. His first book of poems was published by High Chair in 2016.